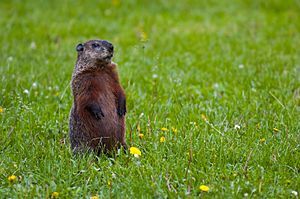 Groundhog Day is a holiday on February 2. It is usually celebrated in North America. It marks about six weeks before the end of winter. It began in the year 1886. This holiday celebrates "Punxsutawney Phil", a groundhog who can supposedly forecast the weather. Banner of Grundsow Lodsh Nummer Sivva (Groundhog Lodge Number Seven), of Pennsburg, Pennsylvania. Groundhog Day Facts for Kids. Kiddle Encyclopedia.